Combined CMR assessment of late-enhancement (LE) and edema provides a means for discriminating between acute and chronic myocardial infarctions (MI). Current myocardial edema imaging methods are limited to a single cardiac phase. Cine imaging that has the capacity to visualize myocardial edema (acute MI), may improve the efficiency of CMR exams. Balanced SSFP (b-SSFP) imaging can be used for cardiac phase-resolved acute MI imaging since, (1) its intrinsic T2/T1 signal weighting may be used to discriminate between edematous and healthy myocardial regions, and (2) it is routinely used for CMR assessment of function. Yucatan mini-pigs (n = 11) were operated on using procedures and protocols approved by our institution. A balloon catheter was used to occlude the left circumflex artery for 90 minutes to induce MI. All MRI studies were performed using a Siemens Sonata scanner on day 3–4, post MI, and were breath-held and ECG-gated. Following scout scans and whole-heart shim, multiple short-axis 2D-b-SSFP images were acquired in the cine mode covering the whole left ventricle. Scan parameters: voxel size = 0.9 × 0.9 × 6 mm3; flip angle = 45°; TR/TE = 3.1/1.5 ms; averages = 2–3; 20 cardiac phases. Short axis LE images covering the whole left-ventricle were acquired at mid systole following intravenous infusion of a gadolinium chelate (Magnevist). Scan parameters: voxel size = 1.3 × 1.3 × 6 mm3; TR/TE = 362/4; and TI = 200–240 ms.
Based on trigger times, the corresponding LE and cine SSFP images were matched. On the basis of LE images, healthy regions of the myocardium were identified, and the mean and standard deviation (SD) of the signal intensities of these regions were computed. The infarct zone was identified as the myocardial region with greater than twice the SD of the mean signal intensity from the healthy regions. Using this criterion, the infarct zones were identified on a pixel-by-pixel basis and the total infarct areas and the corresponding average signal intensities of the infarct areas were computed. This was performed on every imaging slice positive for LE and the corresponding SSFP imaging slices. 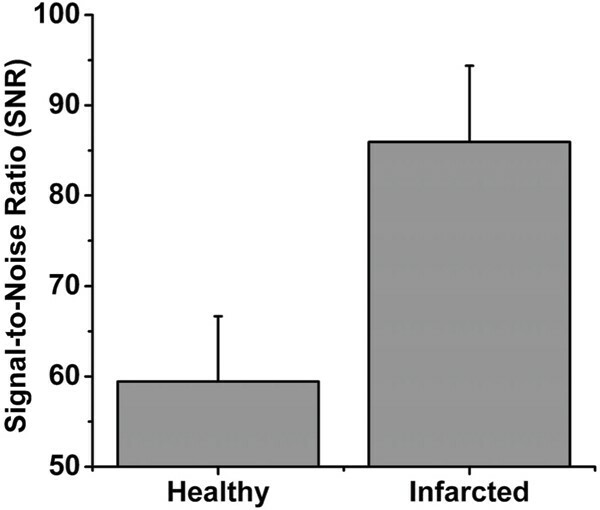 From the measured SSFP signal intensities, average signal-to-noise ratios (SNRs) of healthy and infarct zones were computed for each animal. A paired t-test was used to test the null hypothesis that the average SNR of healthy and affected regions are the same. A linear regression analysis was performed to test whether the computed infarct areas from LE and SSFP images were correlated. Results were deemed significant for p < 0.01. A set of end-systolic short-axis SSFP and LE images over the left ventricle are shown in Fig. 1. Note the close correspondence between signal enhancements in the SSFP and LE images delineating regions of infarction. Statistically significant differences were observed in SNR between the healthy and infarcted regions (Fig. 2). Linear regression analysis showed: (1) strong correlation between infarct area computed using LE and SSFP images and (2) the area computed from the SSFP images overestimated the area computed with LE (Fig 3). A repesentative set of short-axis SSFP and late-enhancement (LE) myocardial images (base to apex (left to right)) obtained from a pig on day 3 of infarction/repurfusion protocol. Note the close correspondence between SSFP and LE images. In particular, note that the hyper-intense (hypo-intense) regions of the myocardium in the LE images can be visualized as hyper-intense (hypo-intense) regions in the SSFP images as well. Mean signal-to-noise rations (SNR) computed from healthy and infarct sones identified on short-axis SSFP images. Results show that in the acute infarct zones, the SSFP signal intensities are elevated relative to the healthy zones and that the difference in mean elevated SNR between the regions is significantly different (paired t-test, p < 0.01). Scatter plot showing the correlation between the infacrt area computed from LE (ALE) and SSFP (ASSFP) images. Equation for line of best fit: ASSFP = 1.14 ALE = 9.95. 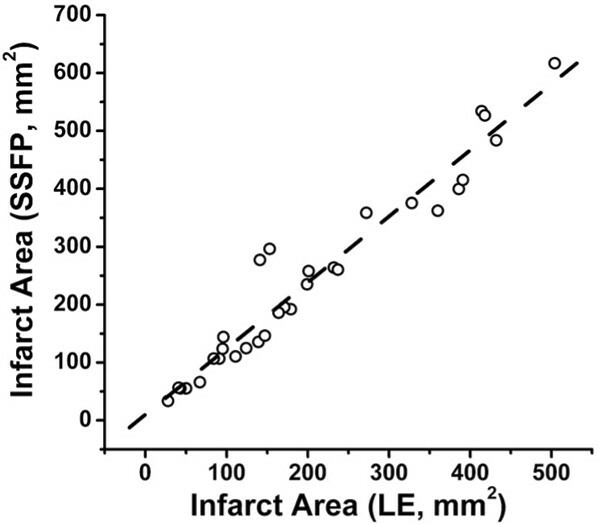 A strong correlation was observed between the two measures of infarct aread (r = 0.97, p < 0.01) with ASSFP overestimating ALE (slope > 1). The elevation in signal intensity in regions of the infarct zones identified by LE is consistent with the expected elevation in T2/T1 values in the edematous zones of the myocardium. The over-estimation of the infarct area in the SSFP images is consistent with previous findings showing that the hyper-intense regions in edema-weighted images consist of true infarct zones, as well as regions that are at risk of becoming infarcted. Our preliminary animal studies show that cardiac SSFP cine imaging can detect the presence of reperfused acute MI. Further validation is required through patient studies.